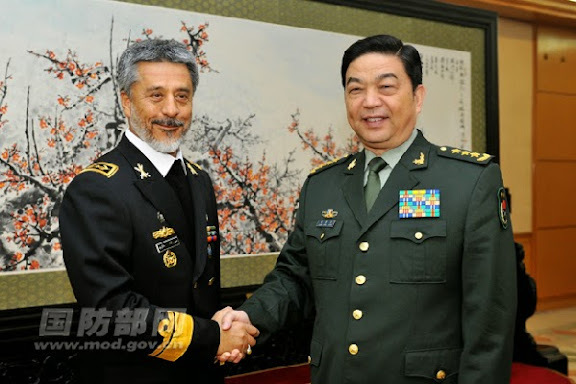 Above: Commander of Iran Navy Rear Admiral Habibollah Sayyari with China Defense Minister General Chang Wanquan in Beijing, dated 23OCT14 . Chinese Defense Minister Chang Wanquan on Thursday met with visiting Iranian Navy Commander Rear Admiral Habibollah Sayyari on naval cooperation. Chang said the two armed forces have seen good cooperation on mutual visits, personnel training and other fields in recent years. Exchanges between the two navies have been fruitful and their warships have paid successful visits to each other. Chang, also a state councilor, stressed China is willing to work with Iran to further pragmatic cooperation and strengthen military-to-military ties. Praising the achievements of the Chinese Navy, Sayyari said Iran attaches great importance to its relationship with China and is ready to enhance bilateral exchanges to push forward cooperation between the two armed forces, especially in naval cooperation. COMMENTARY: According to DefaPress, IRIN Commander Rear Admiral Sayyari visited the North Sea Fleet Headquarters at Qingdao Naval Base on the second leg of his China trip, aimed at strengthening military ties and bilateral cooperation between Tehran and Beijing. 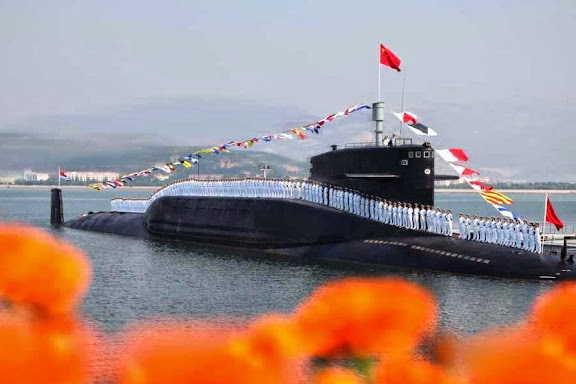 North Sea Fleet (NSF) includes Jianggezhuang Nuclear Submarine Base, home to five Type 091 Han class attack submarines and China's single Type 092 Xia class ballistic missile submarine. As reported by UOI, earlier in the week Rear Admiral Sayyari met with Commander of Shanghai Naval Base Senior Captain Wang Yung, of the East Sea Fleet (ESF). Iran is looking to increase its submarine fleet heavily. The plan is to increase the Kilo class fleet to between 12 to 16 subs. Iran is further looking to have between 1-3 nuclear powered submarines in the future. For all these strategic investments, Iran is looking for cooperation with both China and Russia. Most probably this includes both purchasing of submarines but also joint development. Russia and China have effectively secured their own interests (energy needs) by granting Iran the status of vassalage. Iran get to pick whatever cheap/low quality products and foodstuff on offer by the two super Powers. In return they get massive amounts of oil, gas, iron ore, and various minerals. Also the military equipment and weapons that get cleared for export to countries like Iran, are downgraded versions, equipped with less sophisticated electronics that make it far less capable than the original. Iran's present regime will be building new bus depots on Saturn (and Pyruz will have artist's rendering real soon) before they possess a nuclear submarine. That is your opinion. Mine is different... all super powers secure their national interests first and give whatever is left over to others. So if you have F-16, then it is downgraded, if you have German subs then the export version is downgraded etc. So the difference between them at the end is minor, what is important is to make your own path based on policy which maximizes your own game while dealing with super powers. The Shah was completely US oriented and we saw his destiny, these guys seem to be China/Russia oriented and time will show this is not an optimized path either. You have to deal with all super powers and keep your own national interests in focus. It is not an opinion. It is a fact. Iran earned vast amounts of money before the hardest sanctions went into effect in the middle of 2012. Iran made $114,75 billion in 2011! Two years laters that sum has been halfed! Before 2012 the Chinese and Russians had no other option but to pay Iran in hard currency, and lots of it, in exchange for importing oil. Now they are aquiring Iranian natural Resources through a bartering system, which means dirt cheap. Iran's oil, gas, and what have you, is being given away for peanuts. What Iranians get in return is not even close in measuring up to the value of what is being grabbed by these two superpowers.
" Who would have thought 20 years ago that iran would be designing and building its own submarines and nuclear reactors"
who says that Iran has designed and built a reactor? is it a secret one? LOL! No. Venezuela and Vietnam - they recieve downgrade (monkey models), as do Iran (the Russians actually don't trust the Ayatollahs). India is another matter, it is a true friend and ally of the Russians and a huge bulwark against Western imperialism. Iraq is also a country on the rise recieving the latest hardware from the Russians. There's competition there between American sales versus Russian ones, therefor the Russian put their best stuff on offer. "Theres nothing secret about it the Arak reactor is iranian designed and built...."
research and design institute NIKIET. NIKIET and a Russian company in Obninsk provided technology for the Arak reactor. Nothing is secret. Iran is a nuclear power and no one can deny that. There are thousands of well educated skilled engineers who are working days and nights to get Iran independent and it is obvious that it will take time for Iran to build it own subs and they know that China and Russia are focusing on their interests and they will not give anything to Iran for free. Iran needs two things, get everything well organized and structured and have right leadership and right brains (the one who are really willing to sacrifice his/her time and life for the nation. And of course there are lots of them.